Failure to adequately monitor the effects of the blood-thinning drug Coumadin can cause serious and even fatal injuries. The Washington Post recently highlighted problems with the blood thinner Coumadin on its front page. 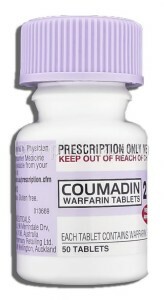 Coumadin, also known by its generic name warfarin, is commonly prescribed to nursing home patients and must be carefully monitored by health care providers. If patients takes too much Coumadin, they can bleed uncontrollably, but if they take too little of the blood thinner, they run the risk of developing blood clots. Medication errors by nursing home staff have put residents at risk of serious injuries and death, according to the news story. In 2007, the American Journal of Medicine published a peer-reviewed study finding that nursing home residents suffer 34,000 fatal or catastrophic injuries related to Coumadin every year. During 2013, ore than 2.4 million individuals received at least one warfarin prescription through Medicare’s prescription drug program, making it one of the most widely-used drugs in America. Despite such widespread problems with Coumadin (warfarin), the federal agency tasked with regulating the nursing home industry – the Centers for Medicare and Medicaid Services – has not fully studied the impact of the blood-thinning drug. At The Cochran Firm, D.C., our nursing home attorney Charles Meltmar routinely meets with clients who have been injured by Coumadin medication errors. Meltmar also represents the families of those who died after nursing home employees negligently failed to monitor Coumadin’s effects on nursing home residents. A study by the non-profit investigative journalism organization ProPublica recently found that nursing homes are not fined after medication problems are discovered, but are instead asked to make corrections and enact new policies. Other anticoagulant drugs such as Xarelto do not require as much monitoring and blood testing as Coumadin, but there is a major drawback to many newer blood thinning drugs: they do not have an antidote if a patient begins bleeding uncontrollably. This serious risk has caused many injured individuals to file Xarelto lawsuits nationwide. Despite its serious risks, Coumadin’s blood-thinning effects may be reversed with vitamin K.
Coumadin is an important drug that, when used properly, can save lives. When nursing homes fail to adequately monitor their residents’ use of Coumadin and warfarin, they are putting the individuals entrusted in their care at an unreasonable risk of harm or injury. If you or a loved one suffered a serious bleeding injury related to a blood thinner, please call The Cochran Firm, D.C. for a free and prompt case review. Our attorneys represent injured nursing home residents and their families on a contingency basis, so there is no fee unless you win.